If you fear losing your entrepreneurial race, there are right steps to take and there are wrong. The good news is not all small businesspeople have cash flow issues. They’ve run the race and survived the marathon. So you’re not alone. You can also be confident in knowing that as a small businessperson, you’re an important part of the nation’s economy. So congratulate yourself for your efforts. Remember, for survivors, strong cash flow doesn’t just happen. They’ve got a system. 1. Start by writing a gratitude list. Digest and relish what’s working in your career and life. Beleaguered business owners spend too much time worrying about what’s not working. This includes little things like consistently saying thank you to your customers, vendors and employees. Forget the hackneyed phrase, “Have a nice day.” Ugh. Just say thank you instead. An attitude of gratitude will help brighten each day and will make you more receptive to new ideas. 2. Chances are you’re feeling disorganized. Write a to-do list of day-to-day priorities. Focus on just one thing at a time. Scratch each accomplishment off the list. 3. Feeling burned out is also a common symptom. Start an affirmation list of your qualities – personal and business. Daily review it and remind yourself of your qualities. No item is too small to list. 4. In cash flow, practice the two Ms – monitor and manage. Take inventory of your situation. Assess where you are by performing a break-even analysis. Predict spending and what trivial expenses can be cut. Make sure, though, you don’t cut muscle – marketing and human resources. Treat your employees as human capital. And make sales and marketing an important part of every day. 5. Understand how your business should profitably function. That’s with business processes, and what is truly necessary for your survival. That, of course, includes key performance indicators (KPI), setting goals and measuring results. KPIs will range from products to customer satisfaction. 6. Be a good listener, but be vocal. Develop strategic partners to save costs and to promote your business. Be seen as a team player. Promote your industry. By building up your profession, you will help yourself. Become the go-to person in the eyes of the community and news media. Besides, it’s true that rising tides raise all boats. Do something positive when your public officials compensate for revenue decreases by creatively increasing fees and taxes, which hurt the economic climate. With like-minded businesspeople, speak out. By brightening your small-business economic environment, cash flow will turn green for everyone, including you. Picture yourself not being uptight about money – there’s enough to go around. Just look out for your industry and company. 7. When feasible, use the three Rs – recycle, reuse and reduce. Unlike a large business, you don’t have big cash reserves and customer base. Leverage all the possible money-saving tools in your business and personal life. Fine-tune as you go, but in general, stick with your roadmap. Don’t panic and steer off course. There are no magical miracles or detours. If you’ve done your strategic planning, don’t engage in worry or self-doubt. Just do the planned footwork. 9. Look for opportunities to multiply your sources of revenue. That includes buying out competitors, especially, if you get a favorable price, terms, and valuable talent. Check with your CPA to see if a leveraged buyout is workable. You’ll save cash flow. Staying current on technology will help you save time and money while increasing revenue. The more mobile you are, the more competitive you’ll become. 11. Look around to help someone less fortunate than you. It will help you keep a smile on your face. Customers, vendors and employees will love it. Use these basics, and you, too, will your entrepreneurial (marathon) race. From the Coach’s Corner, here’s more on entrepreneurship. Checklist – 10 Legal Basics for New Entrepreneurs — Thinking about legal matters can be tedious when you have a lot of details on your plate. But laws and regulations are important when establishing and operating your company. Every region has different laws and regulations — here are some of the fundamentals. Disasters can be devastating to a business. From hurricanes to fires — they can kill a business and workers, and cost jobs. Disasters have put us on notice how important it is to plan and recover from disasters. Texas officials have effusively praised the Trump Administration for its relief efforts in the wake of Hurricane Harvey. But have the nation’s businesses capitalized on such lessons? Consider the devastation from Hurricane Katrina. At wind speeds as high as 127 miles per hour, Katrina ripped into the U.S. Gulf Coast on Aug. 29, 2005. The storm’s accompanying floodwaters overwhelmed the levees and flooded 80 percent of New Orleans. 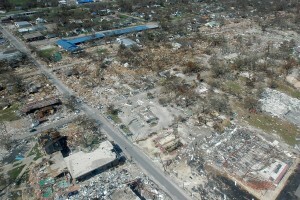 Thousands of schools, businesses and homes were devastated. Life in New Orleans was thoroughly disrupted for businesses and families, alike. Finally, there was good news for New Orleans school kids: School construction flourished. A public charter school, Langston Hughes Elementary, enrolled its first 400 students. But it took four years to rebuild the first New Orleans school destroyed by Hurricane Katrina, and another four years to rebuild 22 other schools. Commerce was severely affected in the aftermath of Katrina. So let’s learn from this. Point fingers of blame if you must at local, state or federal governments. Yes, early rescue efforts in the Gulf Coast appeared to be a disaster themselves. A disaster plan must take into account several un-forecast factors. For example, seemingly lost in all the finger-pointing were questions regarding why at least a third of the first-responders walked off the job. Plus, strategic flood control plans were apparently made in 2001 to protect New Orleans, but were never implemented because they were grossly under-funded, according to a press account. Four years before Katrina, Sen. Mary L. Landrieu (D-La.) and flood control officials apparently requested about $500 million while Congress only appropriated $250 million. It took a week after the disaster before the local and federal governments formally announced a plan to work together. So apparently bureaucracy and politics played a role. Because of the federal tax cuts early in the decade, which I’ve supported, it might be tempting to cut government some slack in the wake of Katrina. That is, if it weren’t for the chronic pork-spending that results in certain members of Congress getting re-elected and the nation’s budget mired deeper in red ink. But companies from Lockheed to Marriott International reportedly had a difficult time contacting and helping homeless and hungry Gulf Coast employees in the disaster’s aftermath. Data recovery was also problematic. Hewlett Packard disaster recovery spokesperson Belinda Wilson said her company served banks, chemical companies, government agencies, health care firms, and manufacturers. She was quoted as saying many were prepared for such a disaster but she was aware that many more weren’t. That patterns the findings of a post-Katrina AT&T survey of 1,200 businesses in which 33 percent admitted they didn’t have a business continuity plan. Of those with a disaster strategy, 17 percent had never been tested. Such devastation threatens a company’s three core assets: Finances, reputation, and people. Katrina certainly highlighted the need for effective communication and strategies for catastrophes. Just as victims in New Orleans expected police officers to stay on the job in the face of natural disasters, companies and management are expected to provide an effective response for employees, their family members, customers, and suppliers. Many regions of the U.S. can face similar disasters, such as fires, flooding, snowstorms, power outages, and earthquakes. Where do you start in a business continuity plan? Your employees. Remember, aside from innovation and profitability, companies are revered when their employees are respected as paramount. You are only as strong as your team of employees. And guess what? In an emergency, employees will worry first about their families, homes and pets. As you would expect in the aftermath of Katrina, it is worth noting that none of the interviewed victims worried out loud about her or his employer. This also means even if you have the best continuity plan, you might not have anyone around to implement it. Don’t forget your customer relationships. Make certain your employees are empathetic to traumatized customers. Obtain appropriate insurance to benefit your relationships. Determine the employees on whom you will depend to carry out a continuity plan. Consider possible incentives for them to show up and follow through in disaster. Maintain a detailed and distant offsite contact list of your workers. Make certain your plan includes room and board for your key employees. Establish policies for paying anticipated employee costs in implementing the plan. In your offsite location, store all maps and details. Determine what other measures are needed if authorities prohibit you from entering your business. Consider the need for counseling of your workers or other extraordinary measures to get people on their feet. Practice implementing the plan; some firms do each quarter. Educate employees regarding the plan and each person’s role. Make certain your employees are good representatives of your company in an emergency, if they suddenly become extemporaneous spokespersons on TV news programs. Network or share facilities with other firms your size for economies of scale. Safeguard your payroll system to be online within two weeks. Have a password-protected non-exempt section on your Web site and make allowances for employee questions and daily e-mail update. For managers, have a password-protected section allowing for questions and daily update. Develop key crisis-communication messages for managers to share with their employees. Don’t forget messages to include all stakeholders, such as the media, customers, partners, and government. Make certain your messages are accurate, but withhold necessary confidential information and explain why you must do so. Be empathetic in style and tone with employees and their family members. Encourage your employees to have a disaster plan for their families and to have an out-of-state contact person. In addition, here are tips for filing an insurance claim. There are times to put a spin on events and there are times not to do so. Remember, if you are in a negative situation, do not try to put a positive spin on it when it’s unwarranted. The truth works. And if you’re asked a question, do not try to dodge it. Answer reporters’ questions. Most journalists will cut you some slack and allow you time to add salient information, if you’re honest and dedicated in your approach with them.